For more information about our partnership with Atlantic Partners EMS, visit their website, www.apems.org, or call 207-974-4880. Click Here to apply for the EMCC EMS program (associate degree or certificate) OR to begin the registration process for individual EMT courses! The EMS program provides individuals who work with ambulance services, rescue squads, fire services, and other first responder organizations the opportunity to earn either a certificate or an associate in applied science degree OR to obtain licensure at the various levels (without earning a college credential). 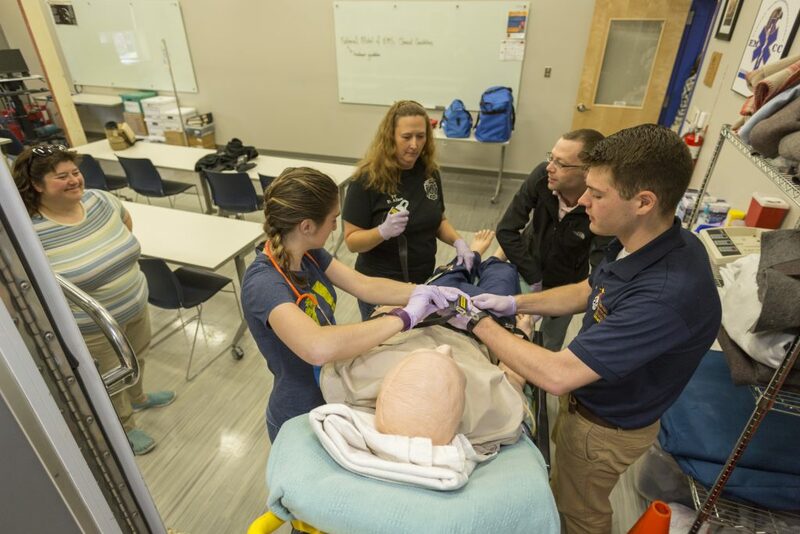 The Advanced EMT pathway is designed for individuals who are currently licensed (or licensable) at the EMT level and the Paramedic pathway is designed for individuals who are currently licensed (or licensable) at the Advanced EMT level. *An application specifically for EMT is required even for those students who are currently enrolled in another program of study at EMCC (ie Liberal Studies or Fire Science) and want to add EMT123 to their course schedule. Financial aid eligibility requires individuals to be accepted to and enrolled in a program of study; therefore, if you require financial aid to pay your tuition and fees you must apply for the certificate or degree EMS program (even if you plan only to take the licensure classes without seeking program completion). Since licensure at the EMT (Basic) level is a prerequisite for both the certificate and the associate degree program, students seeking financial aid in order to take that introductory licensing course should consult the Admissions or Financial Aid Office for clarification and advice. In order to be considered for admission to either the certificate or associate in applied science degree Emergency Medical Services program, applicants must have successfully completed high school level algebra I and lab science courses, and either EMCC’s EMT123 (or a transferable EMT course or proof of licensure/ability to become licensed at the EMT level). All previous transcripts (high school, adult education, and college); Indicate all prior academic history, regardless of whether transfer credit is being sought. Applicants must disclose all prior colleges attended. Failure to furnish all information on past education may constitute adequate reason for disqualification of your acceptance or subsequent dismissal from the College as well as possible retraction or denial of financial aid funds. SAT scores if graduated from high school within the last three years. Attendance at an Informational Session; which includes sitting for the FISDAP pre-entrance exam, is required for A-EMT and Paramedic applicants only. The complete policy regarding the placement assessment requirement at EMCC is viewable on our website. We strongly suggest that you read this material thoroughly before your scheduled test date. To schedule a test date, select Schedule Placement Testing OR call 207-974-4887 to schedule/reschedule/cancel a test. If you live closer to one of our off-campus centers feel free to schedule your test there, but be sure to have your scores forwarded to the Admissions office. *Those with transfer credit for ENG101 and/or math may be exempt from Accuplacer. Contact Stacy Green at sgreen@emcc.edu for clarification. The selection process used for the EMS program involves an objective assessment of each applicant’s documentation including prerequisite coursework and pre-admission test results. Applicants will be notified of as soon as feasible. For candidates who choose to matriculate in the certificate or degree program, additional enrollment requirements apply. This information will be outlined in your acceptance packet. Once enrollment requirements are met, an advisor will assist with registration for licensure as well as general education courses.